Dirt Genius 280W UV LED Grow Light: Why is this light a bestseller? Dirt Genius 280W UV LED Grow Light Review: What makes this light a current bestseller? 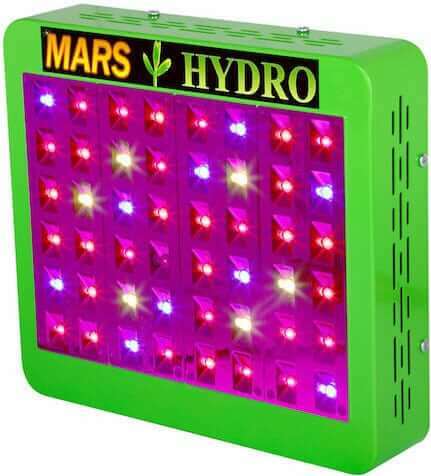 With increasing legalization of medical and recreational marijuana across many US states, many people are looking for the best hydroponic grow lights. We decided to try the Dirt Genius 280W UV LED Panel Grow Light. Just looking at the online description, our attention was drawn to the brand. 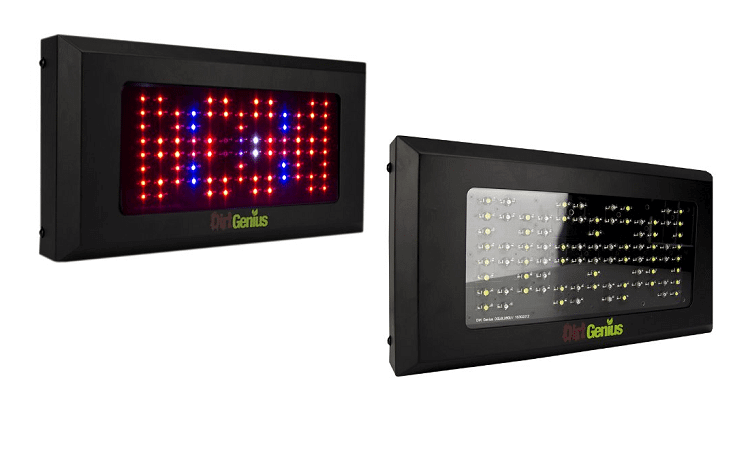 Dirt Genius is well known in the grow light panel industry, so we thought it was a safe investment. 1.3 How Well Does It Work? 3 Would We Recommend This Light to other Cannabis Growers? The Dirt Genius came recommended as an ideal option for growing indoor marijuana plants. At first we were a little skeptical, as the reviews and pictures make this seem just too much like a pretty little light and not a work horse for a serious venture. But it did come recommended by many hydroponics experts. We ordered the panel online and waited for about 5 days for it to arrive. After quickly unpacking it from the safety packaging, we were surprised by its sturdy looks. When our Dirt Genius 280W system arrived, we were certainly pleased. The model has a 6-band spectrum. In hydroponic terms, that means that you give your plants all the wavelengths of light they need to photosynthesize and grow healthy. The ultraviolet (UV) light also stimulates trichome production, as well as other terpenes and cannabinoids. While some infrared (IR) helps make photosynthesis more efficient, to speed up growth. After inspecting the panel, we found it acceptable. The construction and build is durable and well-made. The unit comes with 82 LED light chips that can be easily replaced, which is a nice feature. This means you won’t have to buy the whole panel again when the lights burn out. As for the spectrum, you can use it for a full grow cycle. However, it’s heavy on the red wavelengths, so we’d recommend it most for flowering. For cooling, the back side has three integrated fans, so you don’t have to worry about overheating. Cooling also helps to keep the LED chips functioning well so that they hit their 50,000 hours projected lifespan. The panel has an output equivalent to a 280W HID light, which is substantially better than earlier Dirt Genius models. These are very bright LEDS and we were duly impressed, especially since we had already tried a few earlier grow light kits. The manufacturer states that you can cover 8.75 square feet with the light hung at 36 inches. Strategically angled LEDs also help to keep coverage even across the whole footprint. As experienced indoor plant growers, we look for convenience and flexibility with our tools and products. This panel offers both. 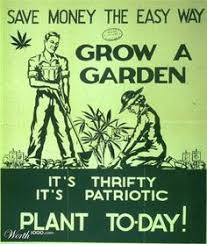 We tried it with the more sensitive of our plants for a couple of weeks and had no problems. Afterwards, we moved it over to the more mature plant section and the plants flourished there as well. It also worked well with the seedlings. However, it’s definitely strongest for flowering. 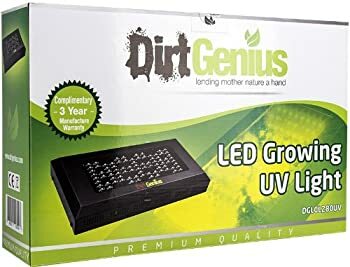 This Dirt Genius 280W UV LED Panel Grow Light works well and with features like bright LEDs, replaceable light chips and a well-made framework, we were rather impressed. Yes, we have seen other comparable kits on the market, but these are often double or triple the price of this model and don’t always include IR and UV wavelengths. Yes. It’s a nice, affordable little light. We especially like that the LED chips are replaceable, and the inclusion of UV and IR wavelengths. Buy this light if you’re looking for an affordable light optimized towards flowering for around 6 plants. Since this review was originally published back in 2016, it seems the manufacturer Dirt Genius has gone out of business. If the light we reviewed is still available anywhere online, we haven’t been able to spot it. So, if that’s what’s brought you here, we hope you’ll appreciate these links to alternatives. Viparspectra V300 Full Spectrum LED Grow Light – Our readers’ favorite grow light just happens to be a perfect replacement for the Dirt Genius 280W, and significantly cheaper. Roleadro GalaxyHydro 300W – Replaces a 300W HID light, includes UV & IR, but comes in at around half the price of the Dirt Genius. Ledgle 300W Full Spectrum LED Grow Light – Another popular budget option with UV & IR. Spider Farmer R90 450W Full Spectrum Dimmable – 450W HID equivalent, with UV, IR and dimmer controls. 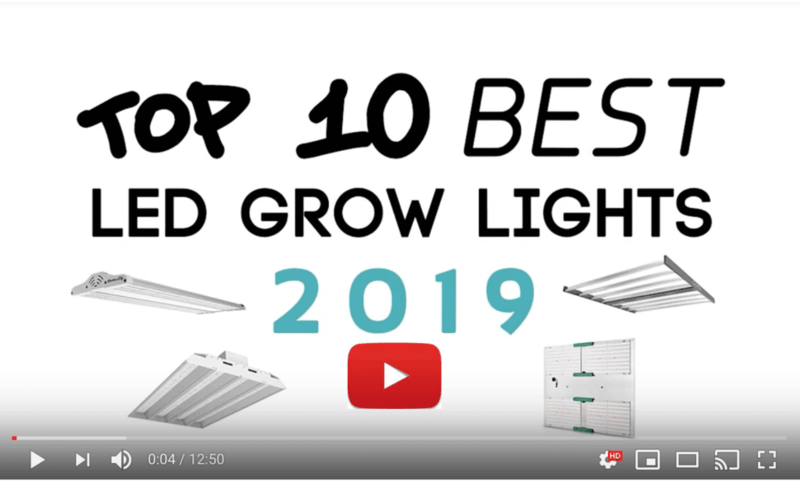 And be sure to also check out our sister site’s round up of the Best LED Grow Lights currently available (2018). Wondering what the actual draw of energy is in wattage. I know it can’t be a full 280watts. Thanks! I believe actual draw was around 160W. However, DirtGenius lights are no longer in production and we haven’t seen this one available anywhere online for quite a while. We’ve suggested some similar lights in the same price bracket at the end of the post.